Dee Dee Blanchard was never going to be up for Mother of the Year, but Patricia Arquette’s portrayal of the nightmare mom — who suffered from Munchausen syndrome by proxy — could generate some awards buzz. Of course, that opinion is completely based on “The Act’s” 41-second teaser, which Hulu unveiled Monday morning at the Television Critics Association press tour. “The Act” is a seasonal anthology series that tells startling true crime stories. The first season follows Gypsy Blanchard, a girl trying to escape the toxic relationship she has with her overprotective mother (Arquette). Her quest for independence opens a Pandora’s box of secrets, one that ultimately leads to murder, per Hulu. This installment of the series is based on the article “Dee Dee Wanted Her Daughter to Be Sick, Gypsy Wanted Her Mom to Be Murdered” by Michelle Dean. In addition to Arquette, “The Act” Season 1 stars Joey King, Chloë Sevigny, AnnaSophia Robb and Calum Worthy. This season is written and executive produced by Dean and Nick Antosca. Greg Shephard and Britton Rizzio are also executive producers. Hulu’s “The Act” debuts with two episodes on Wednesday, March 20. Subsequent episodes will be released every Wednesday on the streaming platform. A smart choice of future Rock and Roll Hall of Famer behind such hits as "Splish Splash" and "Mack the Knife." The three-time Grammy-winning comedian went on to become a huge TV star. The pianist and pops conductor had a long and distinguished career. How could Grammy voters pass over Frankie Valli's The Four Seaons or the folk legends Peter, Paul and Mary? The classical chorus wins over singer-guitarist Trini Lopez? Um, OK.
Yeah, we've heard of these guys. The Welsh singer seemed old-fashioned even at the time -- especially compared to the Byrds. (No award given in 1967.) The country star was one of the genre's first to write her own material. Poor Elton. At least the Partridge Family didn't win. Another boring, safe choice that snubs legends like Gibb and Foreigner. Doesn't feel like the first time the Grammys have gone the wrong way. Really?! You pass over Elvis Costello and The Cars for the "Boogie Oogie Oogie" duo? The "Sailing" guy bests the Pretenders? Take me away. Love Sheena, but Luther and the G0-Gos made a bigger impact. Boy George vs. Annie Lennox. The Grammys got this one right. At least the Grammys didn't Rick-roll Tracy Chapman. Granted, the Grammys rescinded the award after the pop duo Milli Vanilli were exposed as lip-syncers of other vocalists. But the fact that they beat great artists like Indigo Girls and Tone Lōc in the first place is embarrassing. 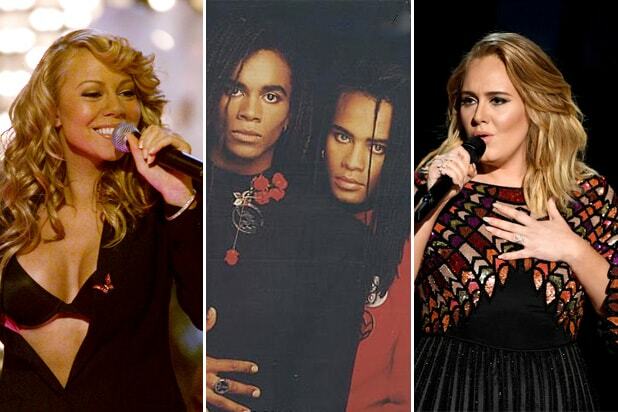 One year after the Milli Vanilli debacle, Grammy voters got it right. Another vanilla choice in a year in which Boys II Men and Seal were both contenders. Green Day gets no love. Guess Darius Rucker's band name didn't effectively warn Grammy voters that it would not withstand the test of time. I don't wanna wait... for my career to be outshone. What a really strong year for new artists. Lynne wins on her sixth studio album -- and beats future country superstar Brad Paisley? Whatever happened to Norah Jones? It's a wonder Yeezy didn't storm the stage to demand a recount. Sorry, TSwift. Hard to argue with this choice of a gone-too-soon legend. Does anyone even remember Fun?